Bob graduated with a Bachelor of Electrical Engineering degree (with a minor in physics) from the University of Delaware in 1974 and went to work for E I DuPont in their corporate engineering division. His major assignments centered around the mechanization of DuPont's fiber and film production plants where Bob developed industrial control systems for a variety of applications. After 10 years of various assignments Bob was transferred to DuPont's Glasgow Site where he worked in the Printing & Publishing, Medical Diagnostics, and later the Medical Imaging Departments. In 1997 DuPont sold their Medical Divisions to Sterling Diagnostic Imaging. In 2000 Agfa bought Sterling and the workforce was reduced from 500 to 30. As Bob had sufficient service and age he elected to retire with a small pension. Bob now does product safety and EMC compliance consulting on a part-time basis. He has provided consulting services for CheckPoint Systems, a manufacturer of radio frequency security and identification systems; BioData Corporation, a manufacturer of thrombosis, hemostasis, and platelet analysis products; Circadiant Systems (now JDSU) makers of optical network test equipment; Accutome, a medical device company specializing in ultrasonic ophthalmic devices; and Johnson & Johnson companies including Immunicon who specialized in cancer diagnostic test equipment; and Therakos, a company that specializes in photopheresis systems. Bob's diverse interests also include writing industrial control software for programmable logic controllers and maintaining custom software programs and computer systems for several local businesses. From 1978 until 2006 Bob was an adjunct professor at Delaware Technical and Community College; Bob maintains an active interest in theatre pipe organs and maintains several as needed. Bob has a small instrument in his townhome and he is a charter member of the Dickinson Theatre Organ Society. From 2006 until 2010 Bob worked for the University of Oklahoma's American Organ Institute assisting in the design and set up of their pipe organ shop and the installation of a 3/14 Moller Municipal Organ in Catlett Music Center. Bob provides pipe organ relay, combination action system, and MIDI consultation and system designs to private clients. Bob has served on the scholarship committee of the American Theatre Organ Society since 1993. Bob's major passion is steam; both steam locomotives and steam cars. His special interest is Stanley Steam cars of which Bob owns a 1918 Model 735B 7-passenger Touring Stanley Steamer. Bob acquired his Stanley in 1997 and started a 7 year total restoration of the vehicle. In 2006 the car was featured at the Amelia Island Concours d'Elegante where it was awarded a Blue Ribbon in the condensing steam car class. Bob maintains the top visited Stanley Steamer website on the internet related to the restoration of his car and the general operation of a steam cars called www.StanleyMotorCarriage.com. His steamer is routinely driven and shown in car shows and parades in the mid-Atlantic region of the US. Bob is a charter member and volunteer with the Friends of Auburn Heights Preserve which includes the Marshall Collection of Stanley Steam Cars. Until 2002 Bob maintained a diesel engineer's certificate, steam locomotive fireman's certificate, and conductor's certificate for the Wilmington & Western Railroad, which is a local steam tourist railroad. Bob's other accomplishments include two books; The Programmable Controller Handbook and Red Clay Valley Rails published in 1992 and both out of print at this time. He has a patent (robotic sampler - patent number 4,816,730 ) and a Professional Engineer's license for the State of Delaware (Delaware Association of Professional Engineers License: 5589). Bob also enjoys astronomy, the space sciences, and photography. 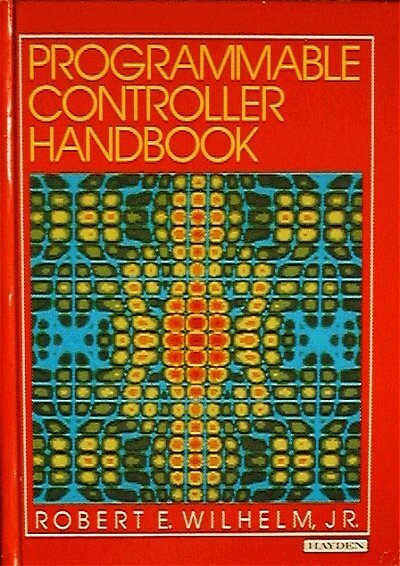 The Programmable Controller Handbook was published in 1985 by Haden Publishing and served as an educational textbook. It was the first technical book ever published which described programmable logic controllers in detail from both a hardware as well as a software programming perspective. Programmable logic controllers are computer-based industrial controllers using relay ladder logic symbology as the programming language. Over 40,000 copies of the 800-page book were printed during the five years it was in print. Newer books on the subject and major changes to industrial automation devices made The Programmable Controller Handbook obsolete and too extensive to revise. Used copies can be found on the internet. While working for DuPont's Thermal Analysis business (now TA Instruments, Inc.), Bob led a team in the development of the first automated sampling device for differential scanning calorimetric (DSC) measuring equipment. The basis for the patent was the robotic technology that allowed it to know how much force to apply in picking up aluminum foil sample pans the diameter of a pencil eraser as well as heavy, half-dollar sized lids for covering the DSC sample chamber. DSC measures temperatures and heat flows associated with thermal transitions in materials. DSC finds application for investigating, selecting, and comparing the performance of research, quality control and production materials. Properties which can be measured by DSC experimentation include glass transitions, "cold" crystallizations, phase changes, melting characteristics, crystallization, product stability, cure times and cure kinetics, and oxidative stability. DuPont later sold the division which now is known worldwide as TA Instruments. 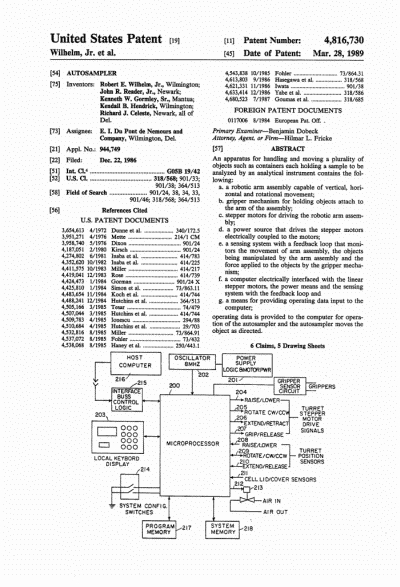 Click on the image at the right to read the patent. 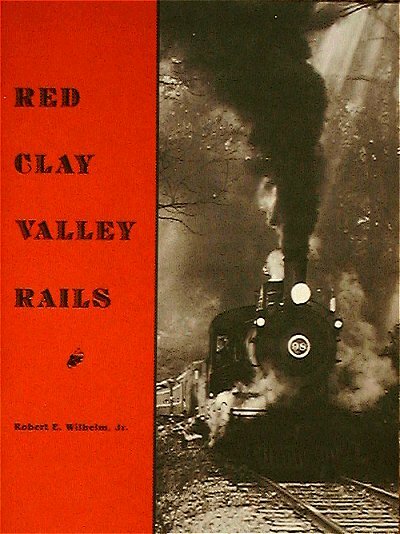 As a result of his activities with the Wilmington & Western Railroad Bob wrote a definitive history of the Red Clay Valley. The Wilmington & Western Rail Road (WWRR) was chartered in 1869 in both Delaware and Pennsylvania and connected Landenberg, Pennsylvania with Wilmington, Delaware. Later the Baltimore & Ohio Railroad (now part of CSX Transportation) purchased the line and it became known as the Landenberg Branch. When the branch line was filed for abandonment after a steady decrease in freight traffic, Historic Red Clay Valley, Incorporated purchased the 64-acres of right-of-way in 1982 continuing their steam tourist railroad operations which occurred on weekends since the early 1960s. The WWRR annually scores as one of Delaware's Top 10 most popular tourist attractions, and Red Clay Valley Rails tells the story of the many industries that the railroad served along the Red Clay Creek in the 1800s. If you'd like to read online only a copy of Red Clay Valley Rails, please click the photo to the left. You will need Adobe Acrobat Reader installed on your computer to read the publication. The file is 22 megabytes in size so a higher speed internet connection is suggested.